Catalonia, the triangular region in northeastern Spain, already has its own language and traditions. Now it’s well on its way to becoming its very own country. 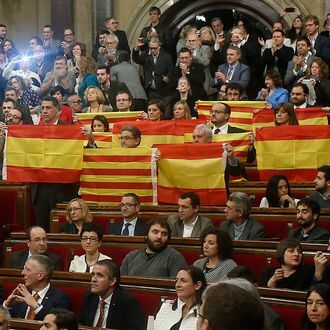 The regional parliament of Catalonia passed a plan for independence on Monday, with lawmakers approving secession from Spain 72 votes to 63, CBS News reports. The region contains Barcelona, Spain’s second-largest city and more than 7 million people; Catalonia also makes up more than 20 percent of the country’s economy, which is probably why the central government of Spain is determined to convince it to stay forever. “Catalonia is not going anywhere, nothing is going to break,” Spanish prime minister Mariano Rajoy said on Monday in a televised address. The government plans to appeal the decision at the Constitutional Court, and the court is likely to rule the law illegal, which will suspend the plan until a decision is reached. But separatists have been fighting this fight for years, and they’re planning on starting an independent state regardless of what the Constitutional Court decides. Raül Romeva, head of Together for Yes, a pro-independence alliance who helped to draw the proposal, explained that this is “the start of a process toward the creation of an independent Catalan state in the form of a republic.” The motion calls for the creation of a new Catalan constitution, which will later be voted on, as well as a new tax office and social security administration. They hope to separate from Spain by 2017. Critics of Catalonian independence say the separatists don’t actually have a democratic mandate to split from Spain. The European Union also warns that a newly independent Catalonia will not automatically be granted admission into its coalition. The fact that those arguing for secession have already split into a few fractious factions before they’ve even managed to break away could also make things super complicated.